By Tommy Robbins. No Man’s Sky is finally here. No doubt you’re already scouring the No Man’s Sky-verse, hurtling through the cosmos on your way to a new and exciting planet. Or perhaps you’re in the camp of those who choose to cross their arms and pout about news of the game’s day one patch. Only one of these mindsets is inherently wrong. Take a guess which one that would be. That’s right. 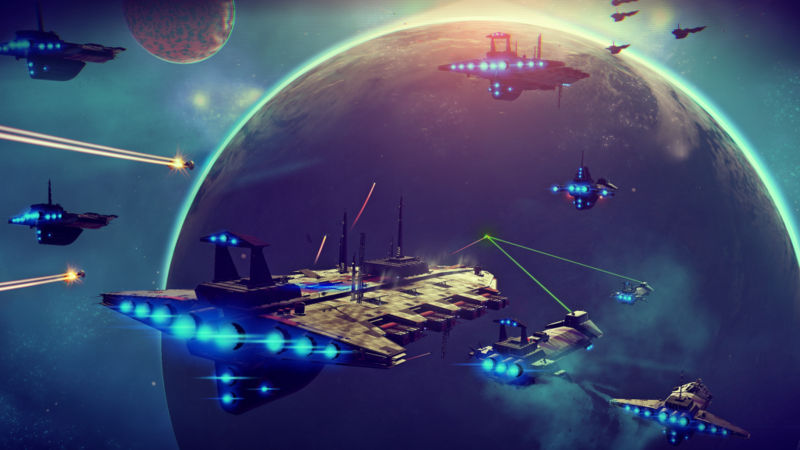 Here on DoomRocket, we’re of the opinion that Hello Games’ No Man’s Sky is already a near-perfect game. (Our review is on the way! — Ed.) For those who haven’t already snagged their copy, and especially for those PC players who have to cool their heels until Friday, let’s talk for a moment about just how awesome the first moments of No Man’s Sky really are, because they really, really are. Be Warned: Though all of our journeys through the cosmos will be completely different and nearly incomparable, this next bit could get a mildly spoilery. 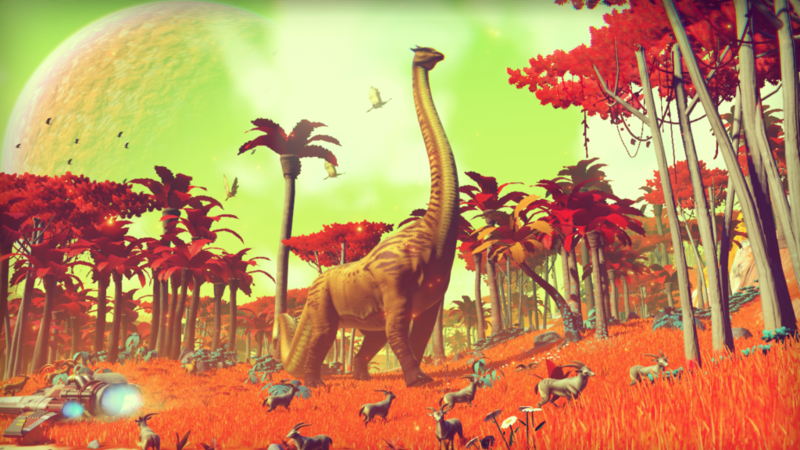 After years of Sean Murray’s larger-than-life reminders regarding just how vast the universe in the game was going to be, somehow the opening to No Man’s Sky immediately surpassed any and all expectations we had. Speeding through space, passing planetary systems at mind-crushing speed was the moment I felt it — the sheer vastness of this thing. Names of entire star systems popping up and vanishing before having a moment to comprehend them, watching an entire universe teeming with variance and life move past my field of vision, me just itching to get closer to truly witness its greatness. It’s an event. The first moments in No Man’s Sky, where my feet were firmly planted on my new home planet, sent a chill up my spine that I haven’t felt from a game in years. I suspected that Sean Murray and the team at Hello Games would orchestrate some sort of choreographed cinematic reveal that carries us (the players) into a blinding white light, opening our eyes for the first time to see the wonder (and danger) of our new home. While my assumption was correct, I wasn’t prepared for the impact that came with such a minimalist approach. Amidst the wreckage of your vessel, a slow and deliberate 180° camera pan unfolds the world before you. For me, a wash of green pastures sprouting a forest of sturdy but slim autumnal trees. For a friend, a much darker planet of boulders and stone, still managing to hold abstract plant life, though much more sparsely than my own. Our experiences so similar and yet completely different. It’s a reminder that there are more utterly unique planets out there, just as grand as my own. The briefly gained sense of place is quickly thwarted by the realization of just how small you really are in this universe. Simply put, the first 20 minutes of No Man’s Sky could legitimately give you an existential crisis. Without diving any further into the moment-to-moment of No Man’s Sky, we can already say that this is an unparalleled feat of game development. This thing is incredible, and we didn’t even mention the impeccably designed, Destiny-inspired UI. No Man’s Sky is all I can think about; its promise of near-infinite surprise gives me the feeling we’re all going to be playing this one for a good long while. A quick word of advice for those seeking multiplayer — open a message and add your friends (easily done on PS4). Share screenshots of your planet, your discoveries, and even your mistakes. Play in party chat and discuss these things as you find them. Though you may never see each other, you’ll discover a sense that we are all part of something bigger, simultaneously charting the universe together, one planet at a time. ‘No Man’s Sky’ is available for PlayStation 4 now, PC this Friday.